Cerastium semidecandrum is an annual herb, very hairy, slightly sticky, stems 5-20 cm long, branched from base or unbranched, slender. Leaves opposite, 0.5-1.5 cm long, basal leaves widest near tip, stem leaves egg-shaped, very hairy, stalkless (sessile). Flowers white, petals 5, slightly shorter than sepals, slightly notched at tip, sepals 5, 0.3-0.5 cm, glandular-hairy, narrow, pointed, margins whitish, stamens 5 (sometimes 10) styles 5, ovary superior to petals, stalks about as long as sepals; inflorescence somewhat compact to open, branching points above small, hairy, paired bracts with whitish margins and tip; blooms April-June. Fruit dry, a cylindrical capsule, 0.5-0.7 cm long, longer than persistent sepals, tip opening by 10 linear teeth to release numerous nearly smooth seeds. 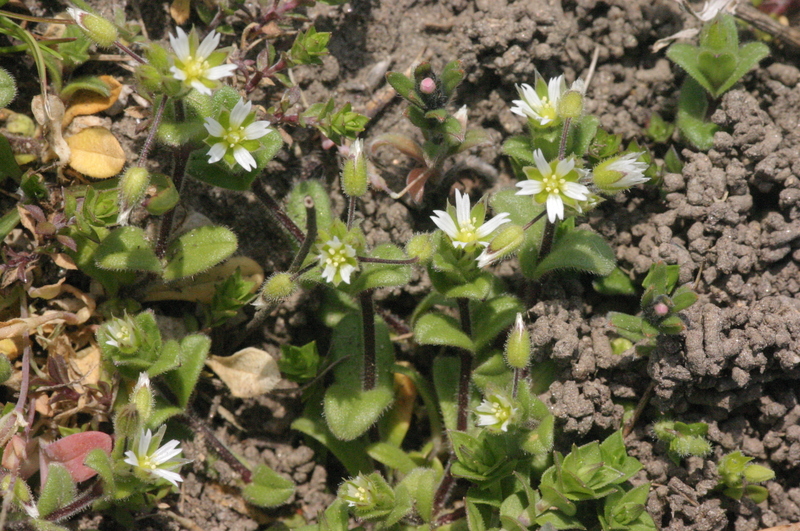 Habitat: Open roadsides, sandy soil, edges; an agricultural and garden weed, generally less common than C. viscosum.